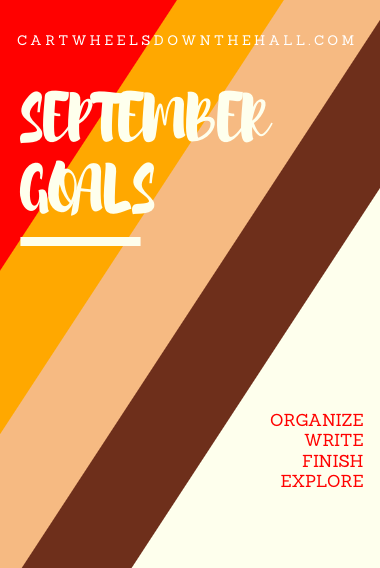 Here are my goals for the month of September. One one hand, I'm worried that it's wayyyy too much...but I also feel like maybe it's nothing I can't accomplish with a solo trip to Starbucks and one or two Saturdays worth of work. I'm pretty unstoppable when I've had the right combination of sleep + caffeine. ;) We'll see! 1. Re-organize finances I know Tim and I are not living "paycheck to paycheck" because I've done the math on numerous occasions. However, it never really feels like we are making any kind of headway on contributing to our savings or paying down our debt. We don't do a very good job of, as Dave Ramsey says, "Telling our money where to go." It just...goes. Ha. With that being said, I'd really like to sit down and re-evaluate where we are financially. I'd also like to set some tangible goals as far as adding to our savings account and paying down our debt. 2. Weed, mulch and plant mums I am super excited for this one. We recently had stonework done on our chimney which meant I didn't get a chance to mulch our flower beds this summer (too much equipment in the way). Our yard has been overtaken by weeds, and it just looks pretty terrible. We've also had a streak of high temps., so everything is looking pretty wilty. I'm looking forward to mulching, digging up a few things, and planting some mums and fall foliage in their places. 4. Buy new bras I won't go into details on this one...but after 9 months of pregnancy and almost a year of breastfeeding, my undergarments have taken a serious hit. Poor Tim. It's bad. It's like I'm wearing the ghosts of undergarments past. I never really found nursing bras in my size, so I just kind of...made do. Next time, I'll definitely splurge on some quality, practical bras. Now that I'm finishing up that part of motherhood, I'm very much looking forward to going out alone...grabbing a latte and getting fitted properly. A shot of vanilla plus whip, please. 5. Ella/Mommy Fun Time ( At Home & Away) This one is a big deal for me. I feel like I get so preoccupied with my daily chores/tasks, I sometimes miss the true "gift" of staying home. I'd like to be more intentional about the time I'm spending with Ella. I mean...we chat during her meal times and we snuggle during nap time. She likes to wander around the house with me while I change the laundry, etc. (She's like a little puppy...haha). However, now that she's getting older and more interactive, I'd love to explore more crafts, sensory activities, and story time ideas. The second part of this goal involves us getting OUT of the house. We run errands and visit family and friends, but I'd love for us to actually go somewhere like The Aquarium or The Children's Museum. She loves to swing at the playground, so that's definitely on the list once the weather cools down a bit. 6. Write our will- This one is kind of morbid, but it's a necessary goal, nonetheless. While I want to make sure our families can benefit from things like our life insurance policies and the equity we have in our home, my main concern is making our expectations clear in terms of who is going to care for Ella should a piano fall on our heads. This is a "must do" on the list for September. It's been hanging over my head pretty much since she was born. It will be nice to have it out of the way. I'd love to hear your thoughts. Do you have any helpful tips for writing a will? Any ideas for where to find plus-sized bras (Jesus, help me!)? What should I read next? Tell me all the things!